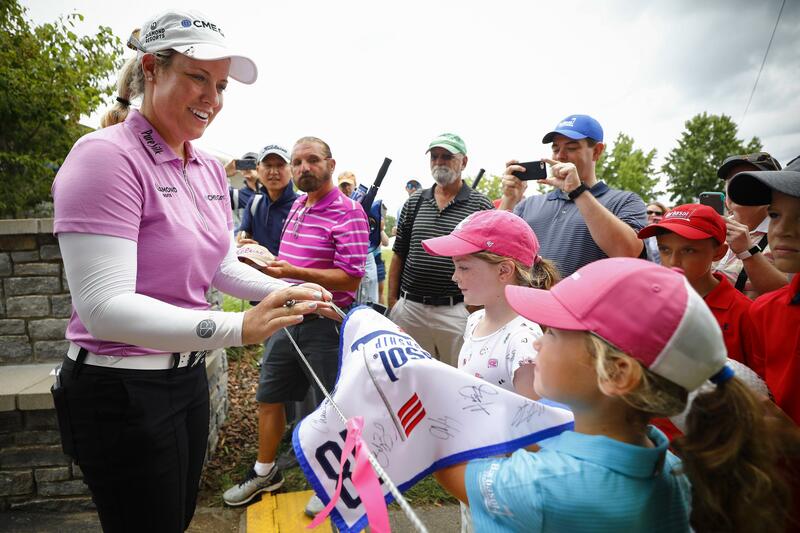 Sat., July 21, 2018, 6:56 p.m.
NICHOLASVILLE, Ky. – Brittany Lincicome walked off the 18th green after her first PGA Tour event to applause before stopping on the way to the clubhouse to sign autographs and acknowledge spectators’ warm wishes. The LPGA Tour player made sure to savor every moment of a historic weekend she wished could have lasted longer. “I would’ve liked to have shot better (Thursday),” said Lincicome, who missed the cut at the Barbasol Championship after shooting a 1-under 71 on Saturday. She failed in her bid to become the first female player since 1945 to make the cut in a PGA Tour event. Meanwhile, the crowd atop the leaderboard includes one of Lincicome’s playing partners. Robert Streb, six-time PGA Tour winner Hunter Mahan, Tom Lovelady and Troy Merritt shared the lead at 18 under after a busy day in which much of the field had to complete the rain-delayed first round before starting the second. Merritt tied the course with a first-round 62 on Thursday. Sam Ryder – who played with Lincicome – and Blayne Barber each shot 63, and Billy Horschel had a 69 to stand within a stroke of the lead. Richy Werenski and Cameron Percy were two behind, J.T. Poston was 15 under, and four more – including Hall of Famer Davis Love III – were within reach at 14 under. Attention before that focused on how Lincicome would finish with her chance of making golf history out of reach. The eight-time LPGA Tour winner with two major titles was the first woman since Michelle Wie in 2008 to play in a PGA Tour event. Lincicome had sought to join Babe Zaharias (1945) as the only women to make the cut. Hall of Famer Annika Sorenstam and Suzy Whaley have also played in PGA Tour events. Lincicome faced a huge hurdle after an opening 78 left her near the bottom of the field. She had six birdies in Saturday’s rain-delayed second round at Champions Trace at Keene Trace Golf Club, highlighted by an eagle-3 at 17. Lincicome also had consecutive birdies on the sixth, seventh and eighth holes before another on No. 10. But her round included six bogeys, including three on the final four holes, and she finished at 5 over 149. Playing partner Conrad Shindler, who made the cut and was tied for 25th, described playing with Lincicome as “a pleasure, a treat.” Despite her roller-coaster performance, he felt her approach was consistent. Her goal now is applying lessons learned from playing with the men back to the LPGA Tour. Lincicome couldn’t immediately say whether she would return to play this event, but seemed eager for LPGA Tour and PGA Tour players to be on the same course in some form. That remains to be seen, but Lincicome definitely appreciated this opportunity with her PGA Tour counterparts. Even without the history. Published: July 21, 2018, 6:56 p.m.